The 2019 CEED Forum is a wonderful way for you and your family to start the new year off right! Join us for round table sessions on earning your college degree, improving English skills, ideas for your business, professional development, and bettering your health. 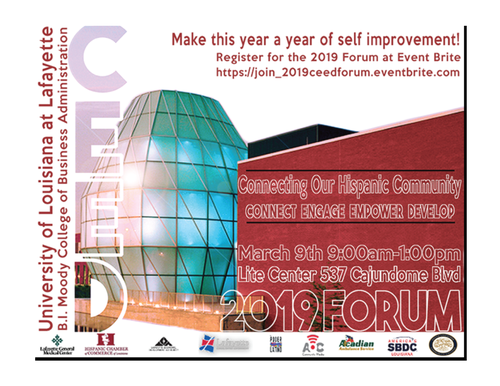 At the CEED Forum you will have the opportunity to meet with specialists and representatives from business, health, government, and educational organizations to talk about the programs they offer in the community. Our speakers include - Mayra Pineda President and CEO of the Hispanic Chamber of Commerce of Louisiana, Dr. Nathalie Harder, Chancellor SLCC, and Dr. Gabriel Carranza, Executive Director of Global Engagement at UL Lafayette. Our 2019 CEED Forum is brought to you in part by B.I. Moody College of Business Administration, UL Lafayette, Acadian Ambulance Service, and El Poder Latino. Connect - Engage - Empower - Develop!